Is Georgia May Foote already struggling with intense Strictly rehearsals? Uh-oh! Is Georgia May Foote already struggling with intense Strictly rehearsals? Could it be? 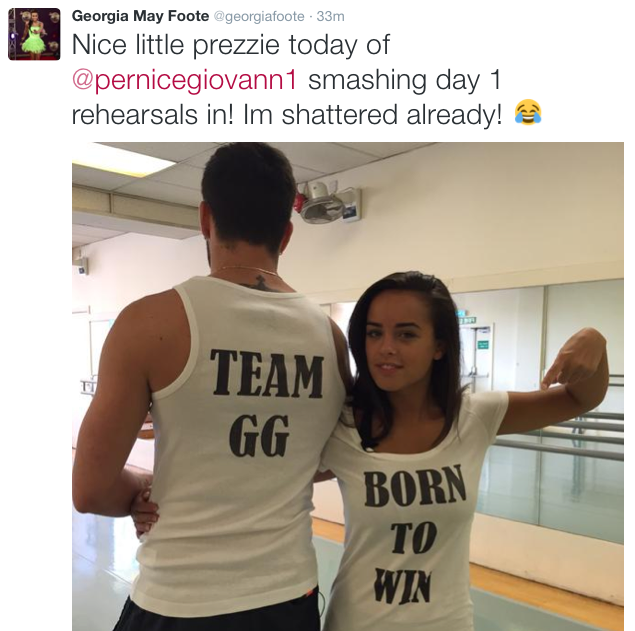 Georgia May Foote, the youngest star of this year's Strictly, is finding it too intense already! This year’s Strictly Come Dancing is bigger than ever with stars including Peter Andre, Kirsty Gallacher, Jamelia and The Wanted’s Jay McGuinness taking part. However, one of the contestants seems to be finding it tough already – and it’s only just begun! Coronation Street actress Georgia May Foote, 24, was partnered with hunky Italian professional Giovanni Pernice, and the pair were quick to encourage the twitter hash-tag ‘TEAMGG’. She is this year’s youngest contestant, and is expected to take the dance-floor by storm. 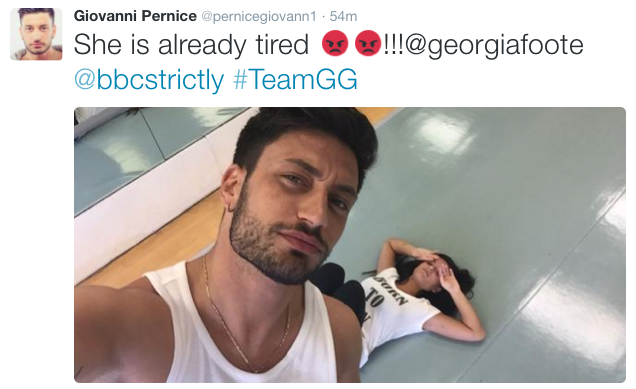 But it looks as though the glamorous Georgia is struggling with the intensity of the rehearsals, after Giovanni took to Twitter to post a photo of her looking beyond exhausted just hours after training begun. Hopefully their winning attitude will rub off on the rest of the rehearsals so they can fight their way to the grand final! Strictly finally returned to our TV screens this weekend and it certainly did not disappoint. It was the most-watched launch show in Strictly history – casually raking in 8.7 million viewers on the first night! Could it be the jazzy outfits that get us all excited? Or is it witnessing celebrities with two left feet transform into perfect ballroom ballerinas? Whatever it is, we sure are ready to obsess over the rest of the series! Following the launch this weekend, the contestants will now get a three week break to brush up on their dancing skills! (Or to simply top up their fake tans). Whatever it is, we’ll be sure to tune in on the 25th and 26th of September to see if Georgia and Giovanni can prove that the tiring rehearsals were worth it.